There are plenty of revered record labels, but few kindle instant recognition and affection quite like Motown. In the Sixties, the beloved Detroit-born label became a springboard for a dazzling list of legacy artists, zigzagging from Marvin Gaye to Diana Ross and the Supremes to Stevie Wonder. It irrefutably defined a new sound too, doled out via 45 rpm records and full-length albums. There's still nothing like hearing a perfectly executed Motown single on the radio, whether it's the Jackson 5's "ABC," Martha and the Vandellas' "Dancing in the Street" or the Supremes' "The Happening"—a joyful, danceable, rhythmically percussive, propulsive, tambourine-driven ragout of pop, soul and R&B. Motown was founded by a former auto worker and songwriter named Berry Gordy, Jr., a visionary man inspired to start his own label, Tamla Record Company, in January 1959 with the encouragement of his friend Smokey Robinson and a family loan of $800. The label was incorporated as Motown Records by 1960, releasing its first hit, Barrett Strong's "Money (That's What I Want)" (cowritten by Gordy) that same year. Gordy's label redefined the course of American popular music. Its captivating roster of artists and irresistible singles broke down racial barriers on the radio and on the record charts too. Motown's ascent paralleled the evolution of the civil rights movement and as a pillar of pop culture, the label gave black American singers, musicians, songwriters, producers and groups the high-profile platform they deserved. Two Motown stars, Mary Wells and Brenda Holloway, toured with the Beatles in North America and the label's artists, like Stevie Wonder, were booked on the once-segregated "American Bandstand" (although the same opportunity didn't extend to black teenagers for years). In addition to the aforementioned artists, Motown's formidable roster included Smokey Robinson and the Miracles, the Jackson 5 and solo Michael Jackson, Martha and the Vandellas, the Temptations, Lionel Ritchie and the Commodores, and the Four Tops. And most of those artists were accompanied by the Funk Brothers, Motown's in-house band that included guitarists Joe Messina and Robert White, bassists James Jamerson and Bob Babbitt, drummers Richard "Pistol" Allen and Benny Benjamin, percussionist Jack Ashford, and keyboardists Joe Hunter and Earl Van Dyke. The Funk Brothers' story was eloquently told in the 2002 documentary, "Standing in the Shadows of Motown." Album-length American masterpieces thrived on the Motown label too: Gaye's What's Goin' On or Let's Get It On, Wonder's Innervisions or Songs in the Key of Life, Lionel Ritchie's Can't Slow Down, Diana Ross and the Supremes' Love Child, the Miracles' Going To A Go-Go, and Diana Ross Presents the Jackson 5 are just a small sampling of releases that altered pop culture conversation. And it wasn't only Motown's music that evoked change. Gordy, now 87, an ingenious businessman and producer, built his empire from his Hitsville U.S.A. offices at 2648 West Grand Boulevard in Detroit, relocating to Los Angeles in 1972. He became a towering influence in the music industry, offering inspiration for other young African-American entrepreneurs and structuring a template for independent labels in an era of socioeconomic revolution and change. In 2015, he was awarded the National Medal of Arts from President Barack Obama for "helping to create a trailblazing new sound in American music." Motown's influence isn't just limited to artists who spun out of the Sixties. After the label was sold by Gordy for $61 million in 1988, Motown continued to sign artists like Erykah Badu, Boyz II Men, Brian McKnight and a teenage Bruno Mars (fatefully dropped early from the label, before his skyrocketing success). It's been 58 years since the birth of Motown Records, but the label's impact still reverberates in contemporary pop, R&B, hip hop and rock. 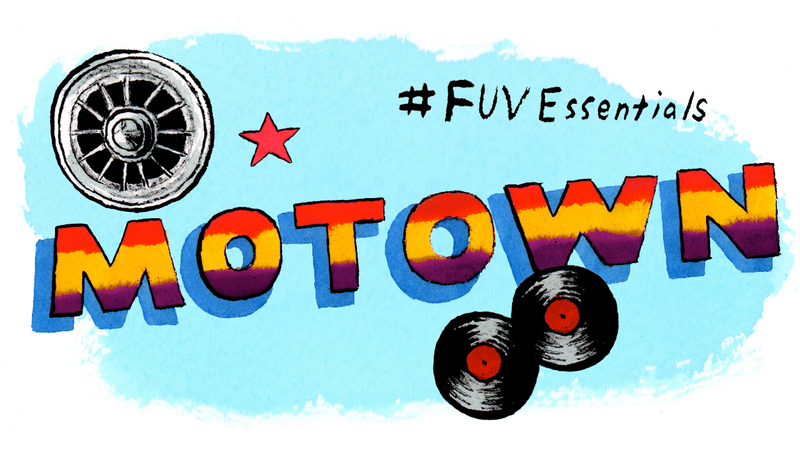 Motown changed music—and the entire label is one of our FUV Essentials.